In the context of the HPR, the term “working” is generally taken to mean that the dog is exercising its natural aptitude to hunt, point and, being shot over, retrieve fallen game, whether this game be fur or feather. The HPR is a variable-range dog that will work the wind and adjust its pace depending on the wind, terrain and/or type of cover. The HPR is regarded as the ideal roughshooter’s dog because of its innate versatility. It will hunt, hold found game on point and flush on command, sitting to flight and being steady to shot and fall. The dog will then on command, retrieve the shot game (including from water), tracking and retrieving wounded game as the need arises. These attributes go largely unappreciated on driven shoots where the dog is used for beating and flushing, or to sit by the peg until the fall of the driven bird, whereupon it is required to retrieve the shot game. These tasks are the main preserve of the spaniel and retrieving breeds. Deerstalkers will often use the HPR as a tracking dog, and falconers often use the HPR to find and produce game for the falcon. However, although it is recognised that many breeds of dogs have been trained to perform to an acceptable level the specialist work of the gundog, it is the trained HPR which will consistently perform to a high standard in a wide variety of terrain and conditions. HPR’s then, are used in game shooting and can be found in the beating line and on pegs, but excelling in rough shooting where its full versatility is being utilised. And this activity is known as “working”, “working to the gun”, “being shot over”. It is entirely acceptable to use the term “working” in the context of HPR Field Trials, which, when run under Kennel Club Rules and Regulations (“the J-Regs”), aim to simulate a day’s rough shooting. At a Field Trial, up to 12 dogs are run in turn, with two judges appraising the work of the dog and handler in finding and subsequently retrieving the shot game. The dog will be assessed according to a number of set criteria as specified in the J-Regs, and provided it has shown sufficient merit and not been eliminated for any number of faults, may be given an award by the judges. As the shooting of game is restricted by law to certain times of the year, and to certain species, other forms of appraising the working gundog have been derived to test the ability of the dog and handler. These usually take place in the shooting close season, i.e. in the spring or summer. These are known as Spring Pointing Tests, and Gundog Working Tests, with the latter being governed by Kennel Club rules and regulations. Spring pointing tests (SPT's) are organised to test the dog's game-finding ability, usually on partridge and/or pheasant, but where the bird is grouse the tests are termed Grouse Pointing Tests (GPT's), and are run broadly in the same manner as SPT's. 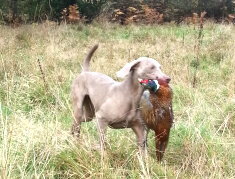 Found game is to be pointed and then flushed on command. No shooting takes place. Stakes are split into Junior and Adult, and the work of the dog is graded, Good, Very Good or Excellent. Dogs which have shown merit but had a blank first run may be given an opportunity to find game on a second, but shorter run. Gundog Working Tests (GWT’s) take place in the summer, on farmland, country estates and often on shooting estates. 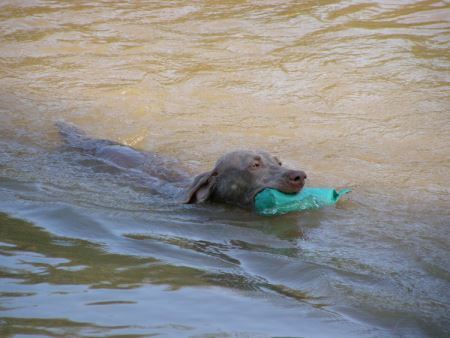 A number of retrieving tests, usually three, including from or over water, (using a canvas dummy), and a hunting test are contrived to test each dog. At Open standard cold game may be used, usually dead pigeon or rabbit, in the retrieve, and a shot (from a starting pistol or dummy launcher) may be fired. These tests are very popular and can be very challenging for dog and handler and to the dismay of some traditionalists seem to have become ends in themselves, rather than a means to an end, and that is a means of testing the work of the gundog for its suitability as a working (i.e. shot-over) gundog. 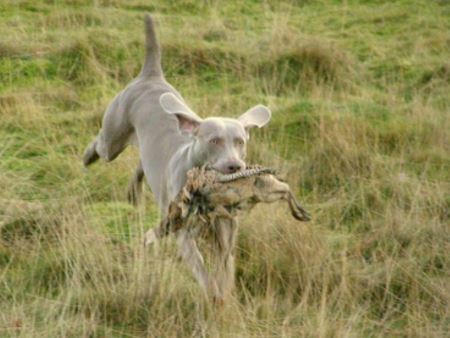 Although the Weimaraner is an HPR gundog, they have been trained to a very high level in obedience, companion, utility, tracking and agility disciplines. These disciplines are often grouped together under the reference “agility and working”. Working in this sense is not to be confused with gundog work, and the tracking discipline is basically to test the dog’s ability to track a human being, such as in police and security work. 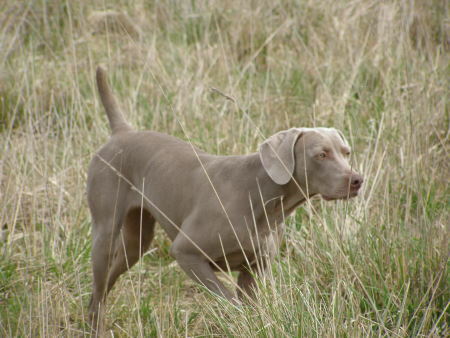 The weimaraner has shown it is a highly intelligent, loyal companion, with the stamina and agility to excel in any variety of disciplines with the correct treatment and training.